Nice concrete pads on gravel pull-through spots. They have 60 sites, all gravel pull-thrus. It is easy access from the road and easy to navigate in the park. Check in was fast and friendly. They have some basic items along with crafts in their store. The park is very well maintained and the laundry and bathrooms are very clean. There is a little road noise but not too bad. We were in Site 54 with full hook-ups. No issues with the hook ups. Our site was next to the picnic area so we had a bit more room than the other sites. WiFi was spotty and our Verizon signal was just okay. Lots of open space to walk the dog. Safeway grocery store and Dollar General next door. We stayed October 12-14, 2017 and paid $28.71 with our Good Sam Discount. I would consider staying here as a destination. If you're the type of camper that appreciates clean, quiet accomodations, this is the one. Really enjoyed the quiet, clean and well organized layout of this park. We only stayed for one night, but it was very good. Easy pull through's even for our extra long truck and TT. 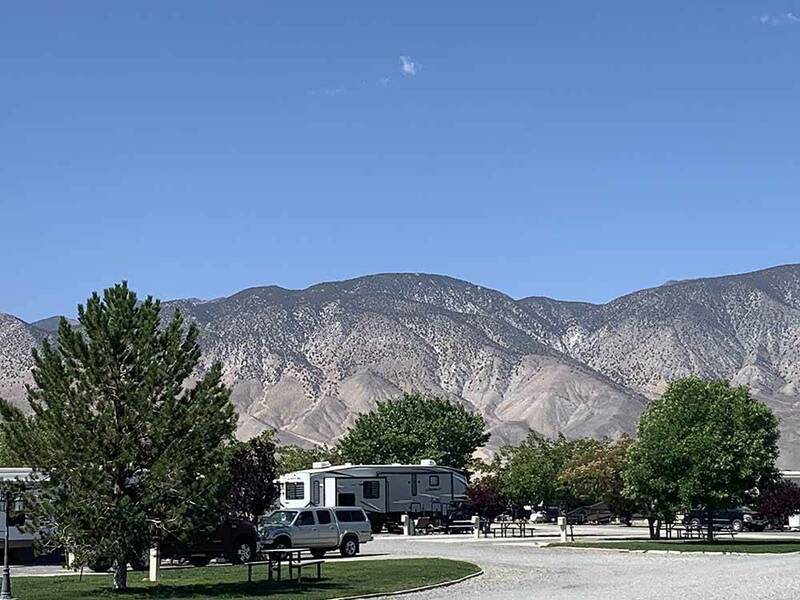 We recently had the opportunity to stay one night at Whiskey Flats RV Park while on our way home to the Pacific NW. This is a very nice park located just off Highway 95 north of Hawthorne, NV. Sites are nicely landscaped, level, large and staggered which provides more privacy in my opinion. Check in was quick and easy and the onsite manager was very helpful. All of the sites are pull-through and easily accommodated our Class A and tow vehicle which didn't have to be unhooked for our overnight stay. Although along the highway the sites sit back away from the road so it was very quiet. We would definitely stay here again when in the area. We stay here a couple of times a year overnight on our way south & return north. It is always clean, neat & well taken care of. Staff are always friendly & helpful. It is convenient to fuel & groceries, easy in and out. The restrooms are very clean and the private showers are nice and have enough room to actually change in. The price is very reasonable for what you get. We definitely recommend staying here. It is not often that I would rate any facility as high as the 5 stars I have given Whiskey Flats in Hawthorne, NV. We spent one night there in late October as we travelled northward towards home. The night was chilly and the slight breeze off the mountain nearby were clear indicators that winter was not far off. The only person we dealt with was the manager who greeted us in the office. He was both helpful and friendly the two or three times we encountered him. Our pull-thru site was clean and level. The (womens) restroom was warm and spotlessly clean. The shower rooms were spacious with a particularly large handicapped room that included a toilet. Shower pressure and heat (both very important to me) were great. I peeked at the laundry room and it was large with a good selection of newish washers and dryers. The Office held reception and a small, well stocked store, a cosy fireplace area with seating, and a good selection of books to swap. There is propane on site, handy as we needed it. Within walking distance on a path well-separated from the highway is a Safeway Grocery and a pizza restaurant. We drove through Hawthorne and were not thrilled with the look and feel of the downtown area, but this RV park is far enough away for this not to be an issue. For being at the side of the highway it was surprisingly quiet, and an easy drive in and out. A great overnight spot and reasonably priced. Nice level gravel pull through sites. Park is well marked with easy access. Easy after hour check in. Will definitely stay here again.